It's on Wednesday 20 June, 6.30-8pm at the Wheeler Centre. Tickets are $35 full/$30 concession. For further details, and to book a ticket, visit the Emerging Writers' Festival website. And definitely check out the program - there's an extraordinary number of terrific events on throughout the festival, so don't miss out. Brisbane events: Love YA! Girls Write Up! & More! Put two talented, powerful, and all-round awesome authors together and what do you get? A fun but fierce conversation of sexuality and strong female protagonists, writing practices, and the hope and beauty found in YA literature that will inspire writers and readers alike. Cath Crowley’s latest book Words in Deep Blue (Pan MacMillan) has already been winning awards throughout the industry including the Gold Inky Award, the Prime Minister’s Literary Award and the Indie Book Award for Young Adult fiction in 2017. 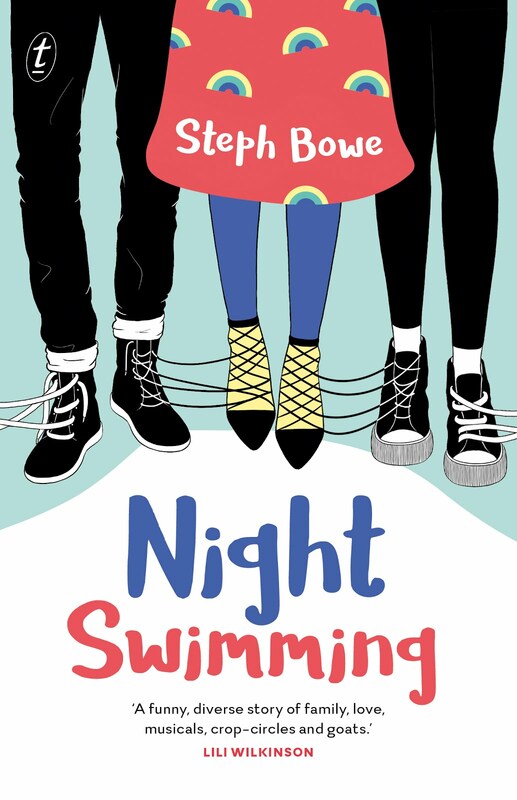 Steph Bowe, whose debut novel Girl Saves Boy was written when she was only sixteen, has stolen hearts, chronicled the complexity of families and charmed readers with her third novel Night Swimming (Text Publishing). Together Cath and Steph will take the stage and talk all things YA at Love YA. Presented in partnership with LoveOzYA. For more details, to check out the rest of the program and to buy tickets, check out the Uplit website. Do say hi if you come along! Girls Write Up is for anyone who has felt limited by gender and wants to understand how language can be used to liberate and empower. It is an inclusive event open to all teens. Over the day, authors, journalists, activists, artists, poets and other creative thinkers will share the ways they have used their writing to define their identities and shape the world around them. The program of panels and practical workshops explores the relationship between language, gender and power, and the effects of unconscious bias on our sense of self. Girls Write Up gives participants the opportunity to discover their own creative voice, equipping them with the skills and the confidence to use it. I'll be presenting a workshop on character development, and there are so many wonderful speakers and workshops and events across the day that you'd be silly to miss out (it's an event for all teenagers, and one that's committed to being inclusive and accessible. Teachers and carers can attend, too). Head over to the Stella Prize website for more details and to book tickets! I recently chatted on the podcast Seeking Tumnus about Night Swimming - if you want to hear me read some of Night Swimming in my very Blinky Bill-esque accent then ramble about my love of very Aussie literature, you should check it out. Seeking Tumnus is a wonderful podcast about children's literature so it's worth listening their other episodes while you're there. Night Swimming is a CBCA Notable! Somerset Celebration of Literature! Podcast! Oh. Hi. I did not, in fact, forget I had a blog. Honest. I just haven't had a chance to blog in so very long. I've been having a rather busy (but excellent!) time visiting schools and writing a thesis and working on my novel. I do have some posts on the way (I have had a chance to read for fun again - and there are a number of wonderful YA titles I want to tell you all about) but for now I'm just quickly popping in to let you know what's been happening. So here are a few exciting updates! First of all, I am beyond thrilled that NIGHT SWIMMING is a CBCA Notable for Older Readers! It's an extraordinary list with a lot of fabulous titles on it (check it out here) and I feel very honoured to be featured alongside such talent! This is my first CBCA Notable and it's a pretty special feeling! Secondly, I will be appearing at the Somerset Celebration of Literature on the Gold Coast this week! It's an awesome festival and I've had such fun attending in the past. I'll be presenting a number school sessions, and I'll also be appearing on a panel on Storytelling in the Electronic World. For more info, check out Somerset's festival guide. Finally (for now! ), I recently appeared on the Words and Nerds podcast. You can listen to me chat about NIGHT SWIMMING and developing unique characters here. Come along for a day of industry seminars and hands-on writing workshops for young writers, led by young authors and publishing professionals. If you’re aged 15 to 25 and interested in the art of writing and the how-to of getting published in Australia, the Young Writers Conference will excite, inform and inspire you. With sessions designed to expand your knowledge, accelerate your craft, and provide advice and support for getting ahead in the business of writing, this is your opportunity to learn from some of Australia’s finest young creators in an inclusive and interactive environment. Featuring Lech Blaine, Steph Bowe, Shastra Deo, Laura Elvery, Mindy Gill, Jerath Head, Rebecca Jessen, Bri Lee, Grace Lucas-Pennington, Grace McCarter, Jackie Ryan, Kristina Schulz. In this inspiring session, young published authors share the journeys behind how they made it to where they are now. From why they became interested in writing, to how they got published, hear from the writers who made their dream a reality and what they plan on doing next. 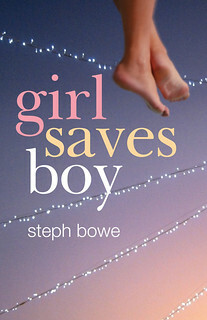 Learn how to make your characters come to life on the page with Steph Bowe, author of YA novels Night Swimming, All This Could End and Girl Saves Boy. For further details, check out the State Library of Queensland's website. 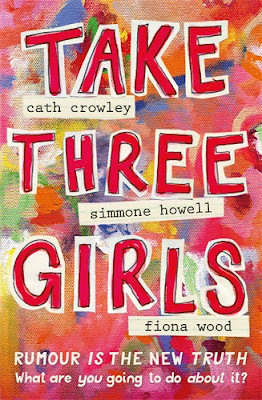 Take Three Girls focuses on Ady, Clem and Kate, boarders at a prestigious private girls' school who are thrown together by a school 'wellness' program and who are dealing with a whole slew of issues - including being targeted by a sexist and disgusting website. I found the novel a little jarring at first - it took me a while to get a sense for each of the girls' voices, and the multiple viewpoints, plus diary entries, plus wellness program sheets, plus excerpts from PSST (the website) made for a beginning that was very busy. I'm mentioning this because if you pick up this book and struggle through the start - keep reading! Though I read the start slowly, once I was familiar with the characters (and once they had met each other), I found it much more involving and I read the rest in one sitting. The format that had seemed excessive at the start gave the novel depth and realism, and made for a more immersive experience. The character voices are distinct, but work together really well. I would love for these three authors to collaborate again. 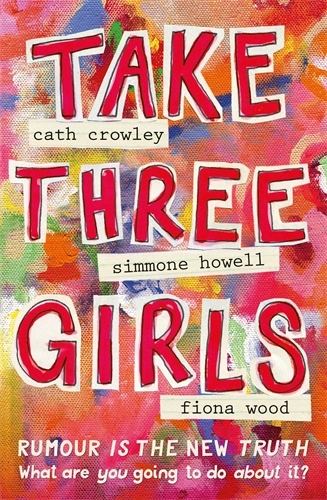 Take Three Girls is a novel I would recommend to any fan of contemporary YA novels - teenagers and adults alike. 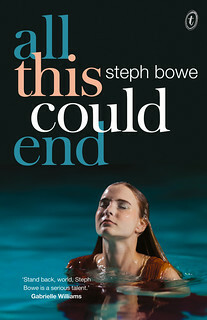 I think there can sometimes be a tendency for YA now to be aware of the size of its adult audience and (consciously or not) cater to that audience, and though Take Three Girls is a complex and thoughtful novel that engages with themes around feminism and social justice, it is still unashamedly about and for teenage girls. While each character has a romantic plotline (and I really appreciated Ady's romance storyline and how her bisexuality was depicted in the book), themes of friendship are definitely the focus. It is both very thought-provoking and very accessible - the issues (and they are many!) are never at the expense of the enjoyability of the novel. It's engaging and sincere and uplifting and a novel I hope many, many teenagers read. Take Three Girls on the publisher's website. I'm super excited to be presenting a workshop as part of Tracks: Brisbane on Saturday, October 21. 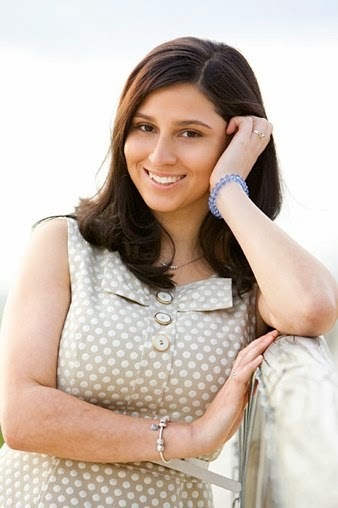 It's an awesome all-day program of workshops and masterclasses for writers aged 14 to 25, and it promises to be amazing. Express Media is delighted to present Tracks, a travelling pop-up program for young writers that brings the best of Express Media’s workshops, masterclasses, networking opportunities and special events to communities across Australia. In 2017 we’re bringing the Tracks program to Brisbane, partnering with Queensland Writers Centre and Backbone Youth Arts to take the best of Express Media right to your backyard. If you’re aged 14 to 25 and have a love of writing and storytelling, Tracks: Brisbane is an exciting weekend event just for you. Across the day, you’ll learn from some of the best writers in Queensland, and expand your skills to develop and crafting captivating stories, find out what opportunities there are for you in Brisbane and beyond, and discover what happens when you’ve been selected for publication. Tracks is free for Express Media members to participate in and attend. If you’re not a member already, Tracks: Brisbane costs $25 and includes joint membership to Express Media and Queensland Writers Centre (normally $55). Character is a key element of successful writing. What makes a memorable character in fiction and do you represent real-life people ethically? Do we have to be able to relate to all characters as a reader? How can you get inside your characters’ heads – when they came from yours? Explore strategies for creating believable, fleshed-out figures in your own work. Tracks is on at the East Brisbane Bowls Club on Saturday October 21, and runs from 9am to 5pm. It's an awesome opportunity for young writers, especially considering it's free for Express Media members and only $25 for non-members. To find out more, and to book, head to the Express Media website. I'm thrilled to be running a character workshop as part of Girls Write Up in Brisbane! The event is being held on Friday 24 November from 8.45am to 3.45pm at the State Library of Queensland, and there's an awesome line up of presenters. For more details, and to buy tickets ($35), check out The Stella Prize website.